This work will provide readers with uniquely systematic coverage of the field of speech and language pathology. Taking as its starting point the highly successful Encyclopedia of Language and Linguistics, the book comprises selected updates from the original work combined with a high proportion of newly commissioned material which together give a comprehensive overview of the state of the art in speech and language pathology. The work is the most up-to-date and detailed reference available in this field. The book addresses all main aspects related to speech and language comprehension and production, both in children and in normal adults. It also presents in a systematic way disorders of speech and language due to developmental and acquired causes, the most common forms of treatment and their degree of efficacy. 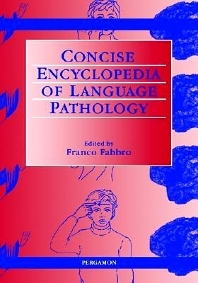 For academic libraries serving researchers and students in all fields of linguistics and psychology, researchers and students in speech and language pathology and therapy, neurology, audiology and pediatrics, researchers in the educational sciences, the philosophy of language and the application of computers in the treatment of communication disorders. Franco Fabbro has written five books and more than 130 articles on neurolinguistic and neuropsychological topics. He is Consulting Editor of the Journal of Learning Disabilities and Associate Editor of Interpreting. He recently guest-edited a Special Issue of the Journal of Neurolinguistics (v. 10, no 4) on Subcortical Aphasia. Holding a first degree in Medicine and Surgery and a PhD in Neurology, Fabbro worked from 1985 to 1988 as a grantee researcher in neuropsychology at the Department of Neuropsychiatry at the Children's Research Hospital in Trieste where he studied, in particular, hemispheric specialisation in normal children and in children with dyslexia, developmental dysphasia and acquired aphasia. From 1988 to 1991 he worked as an Assistant Physician at the Department of Neuropsychiatry at the same hospital in Trieste. In February 1991 he became Full Researcher in Human Physiology at the Faculty of Medicine and Surgery of the University of Trieste. Since 1994 he has been professor of Linguistics and Neurolinguistics at the Faculty of Medicine, School of Rehabilitation and holds the post of chief of the Neurolinguist Unit at the Children's Neurological Research Hospital "E. Medea" in Bosisio-Parini (Lecco, Italy).